Last Friday, 61 year-old James Hudson was killed by a drunk driver while crossing San Francisco’s Masonic Avenue, one of the city’s busiest and most dangerous arteries. The suspect, 23 year-old Jose Jimenez, who was driving over 50 miles per hour in a 25 mph zone, is expected to be charged this week with vehicular manslaughter and driving under the influence of alcohol. Masonic Avenue is one of San Francisco’s most notorious pedestrian accident hot spots, and last week’s death indicates the city’s obligation to make significant steps to make it safer to reduce future deaths. Hudson’s death marks the second Masonic Avenue death in less than a year. Last August, 22 year-old Nils Yannick Linke was killed in a bicycle accident on Masonic and Turk by another drunk driver. Linke’s tragic death has become something of a symbol for the urgent need to make San Francisco streets safer. In addition to pedestrian accident deaths, Masonic Avenue is responsible for many more accident injuries. Last month, for example, a young jogger was blindsided by a car going 30 miles per hour. The accident sent her flying through the air and to the hospital with a broken leg. 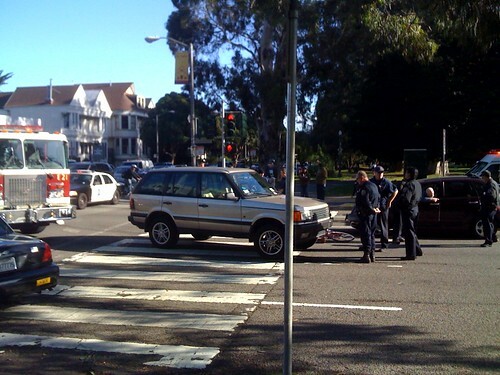 SFWeekly reporter Matt Smith was riding a tandem bicycle with his daughter when he was nearly hit in this same accident. The San Francisco Municipal Transportation Agency has been planning a citywide pedestrian safety plan, with improvements for Masonic Avenue, for months. And this Friday, the agency is scheduled to meet to discuss specifics intended to improve safety, livability, and traffic. One proposed plan, the $20 million “Boulevard” design, was developed by an eclectic group of city agencies, citizens, and community organizations. The Boulevard plan would no doubt improve safety on San Francisco’s Masonic Avenue. But improved safety measures must be complemented by a pledge among city motorists to drive slower and stay aware of pedestrians and cyclists.